How do you practice for a heroic life? I write often about the idea of pursuing the heroic life: a life lived for high ideals, with a sense of purpose, and ultimately a life that changes the world. But a number of people have asked me if there’s a practice to the heroic life: if you decide you want to live it, what should you do? This question always startles me, because to me there has always been one clear answer for how to live heroically: go on a journey. If you want to lead a heroic life, travel. This is not the only way. There are many, many ways. But if you’re looking for a simple practice that will lead you to that sense of purpose, the answer is a journey. Tales of heroism are always tales of journeys, and there’s a reason for this. It’s because inner strength can’t just be given to you; it has to be learned through trials and experience. And a journey is the surest way to get continuous, long term, unpredictable human experiences that will challenge you and change you. In stories, the hero must always go on a journey to develop the qualities needed to save the day. If they didn’t need that experience, then they could just meet a wise man early in the story who told them everything they need to know. The entire middle part of the story, where they try and fail and learn and grow, could just be deleted. They’d listen to the wise person and go directly to saving everyone. Then on to happily ever after. But that isn’t how inner strength is discovered in literature or real life. And it’s also why the heroic life cannot be taught in schools, colleges, churches or temples: a lecture cannot replace the hands on experience of a challenging journey. A journey takes you outside of familiar surroundings and becomes instantly more immersive and thus more transformative. No matter where I go, there’s a certain percentage of people who yearn for a life full of meaning. They’re uncomfortable because they’re stuck in a workaday life that compromises either their ideals or their sense of purpose. Unfortunately, many of them tell me they feel lost and unsure of how to start. In many cases that’s because they’re looking for their life to change without actually striking out toward something new. If you don’t change your surroundings, it’s very difficult to change anything else. From the beginning I’ve written that there are four tenets to the heroic life. They are: to accept that you have a purpose in life, which you yourself must create; to choose your ideals and put them before all else; to pursue your purpose and your art with passion, until you can do amazing things; and to travel. If you don’t know your purpose, your ideals, or your art: go on a journey. A journey will lead you to discover these truths about yourself, and how to live them, with an incredible rate of success. You learn to make friends easily. You become self reliant, overcoming obstacles far from your support network of familiar faces. You learn firsthand that there is good in people everywhere you go. You learn to trust intelligently, and to be generous and open to strangers. You develop a better instinct about who to trust and who not to. You overcome prejudices and misconceptions. You start to see what unites all of us. You learn new skills constantly, and you get better at learning. Things that once seemed impossible now start to look merely like a matter of practice. You get good at making quick, smart decisions in challenging circumstances. You learn who you truly are and who you want to be. A journey can take many forms. It can be a short journey, of 50 or 100 miles. It can be done by car, bus or plane. 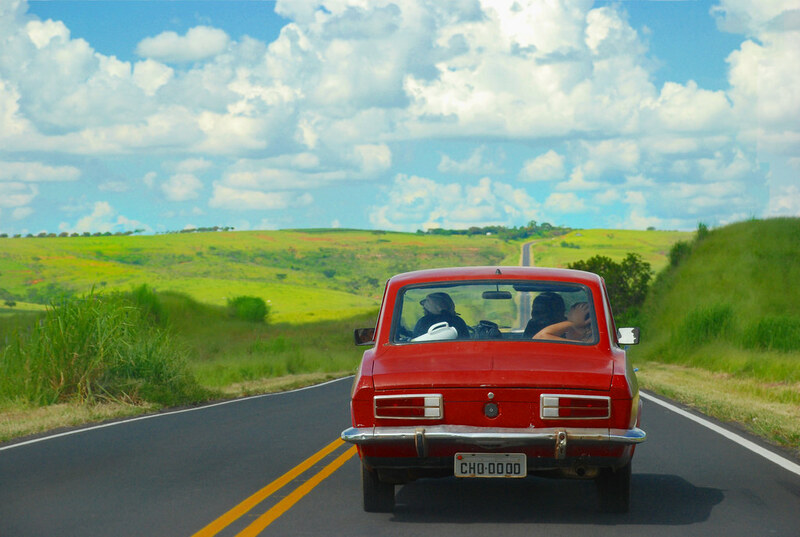 It can be around the world and last years, or it can be a road trip that lasts weeks. You can go entirely by foot, like Nate Damm; or refuse to fly like Niall Doherty. You might choose a destination or you might just wander. It doesn’t matter what form your journey takes. Everyone’s journey is as good as everyone else’s. As long as you leave your familiar surroundings and face some element of the unknown, you are on a true journey. Ultimately that journey will force you to change. Parts of you will dissolve away, and the parts that remain will become stronger. That’s why a journey always reveals your ideals and your purpose: because they are the one part of you that stays constant when everything else is changing. If you want to journey together, I have 120 miles left in Texas and I welcome companions. We can bicycle together for a few days. It will happen this summer or fall. Leave a comment or email me at andre@roguepriest.net and we’ll start to plan. This is an experience that anyone can have and I’m happy to share it with you. But it doesn’t matter if you come with me or do it some other way. Just journey. Journey and you will find yourself. What is your take on belatedness? We can all agree on the fact that while you can be sure that you’re traveling while you’re traveling, you can never be sure about arriving, here, mainly arriving at that sense of fulfilling your purpose. In fact, we can also all agree that many who travel can experience a very uncanny feeling of having arrived too late at whatever realization, or even worse, at no realization at all. Perhaps there’s a reason why all tales of heroism focus on the suffering of the traveller, rather than his moment of zen. I’m interested in the idea of time, timing, and no time here, as it’s quite clear to me that although not believing in time eases the traveller’s suffering, bad timing can kill time, the time that’s important for the purpose. I think I understand the first part of your comment Camelia and it’s an excellent point. I suspect that most of what happens that matters during a journey is during the journey and has more to do with unexpected challenges and situations, and a lot less to do with goals, plans or completing the journey. That doesn’t mean there’s no value to keeping an itinerary, but it likely means something much more valuable cannot be itinerized. it’s quite clear to me that although not believing in time eases the traveller’s suffering, bad timing can kill time, the time that’s important for the purpose. Can you explain it to me like I’m 5? Sure. I like a challenge. Let’s see if I can get this right. The point about time relates exactly to what you’re saying, that it’s during the travelling that the sense of purpose crystallizes, and not at the end of the journey as it may be the result of planning. In fact that was also what I had in mind when I talked about belatedness, namely, not in relation to the end of the journey, but rather while one is at it. The crux of the matter is right here, in this very phrase: ‘while one is at it’. You see, where time is concerned, ‘while one is at it’, the time it takes to be at it is by definition suspended. Not physically, but consciously. Quite literally we never think of the time it takes us to do something ‘while we are at it’. This sense of time only comes either before, in the form of projection – Christ, this is gonna take me forever – or as a realization in hindsight – Christ, that sure took me forever. So, while you’re at it, you don’t experience time passing, but you can experience yourself experiencing, here more specifically suffering for it. In this very suffering one can also experience being at a standstill, hence, the idea of bad timing killing time, and with it the sense of having accomplished something. So, to make it even more crisp, as I can see that this is still too convoluted, I’d turn it around the following question to answer your question: how do you distinguish between skepticism – is it really me experiencing all this, and for what exactly? – and flow – time passes and so do I, with or without a purpose. So, again, when are we conscious travellers, who are also known to be good planners and good at reflecting over the journey, and when are we fools, who are also known to be good travellers in the sense of, well, just travelling through? I suspect that the first are more bothered by the time concept than the latter. OK, I still have the feeling that I’m going around in a circle, but perhaps you can see where I’m coming from with this. To the 5 year old I’d say this: A ‘good’ traveller travels timely but never in time. I think I see what you’re saying, Camelia. Thanks for taking the time (ha!) to lay it all out. I suspect I spend most of my time as a conscious traveler, and not as a fool in your sense of the word.